Autumn Martin of Hot Cakes in Seattle makes grilled chocolate sandwiches that are crisp, gooey and deliciously messy, especially when they’re dipped in a warm caramel sauce. Throughout January, F&W will spotlight the top women in food and drink. Nominate the women who inspire you using @foodandwine and #FOODWINEWOMEN and they could be featured next. 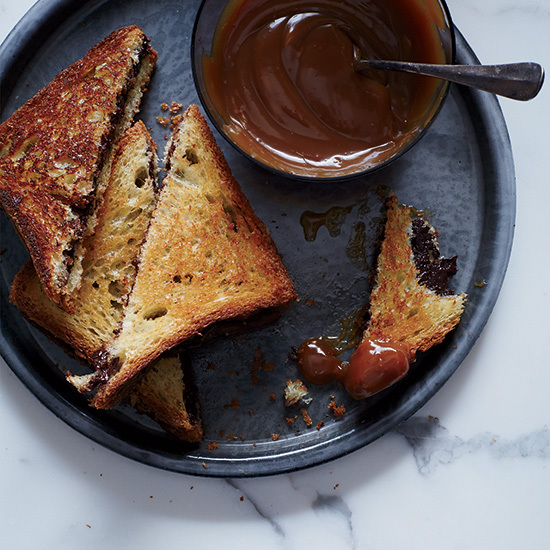 Autumn Martin of Hot Cakes in Seattle makes grilled chocolate sandwiches that are crisp, gooey and deliciously messy, especially when they’re dipped in a warm caramel sauce. She's opening a second location of her dessert and craft cocktail bar, Hot Cakes Molten Chocolate Cakery, later this year. In a heatproof medium bowl, combine both chocolates. In a medium saucepan with a candy thermometer attached, combine the cream, cocoa powder, sugar and salt. Cook over moderately low heat, whisking frequently, until the mixture is smooth and thick and registers 165° on the thermometer, 3 to 5 minutes. Pour the cream mixture over the chocolate and stir until smooth. Let cool to room temperature. In a small saucepan, warm the cream. In a medium saucepan, spread the sugar in an even layer. Cook over moderate heat, without stirring, until the sugar starts to melt around the edges, about 3 minutes. Reduce the heat to low and shake the pan to incorporate the dry sugar into the melted sugar. Continue to cook over low heat, swirling the pan frequently, until a light amber caramel forms, about 3 minutes longer. Slowly drizzle in the warm cream. Cook over moderate heat, whisking occasionally, until the caramel is smooth, about 3 minutes. Whisk in the butter and salt. Transfer the caramel to a small bowl and let cool until warm. Spread 1/4 cup of the ganache onto 6 slices of bread. Top with the remaining 6 slices of bread and butter both sides. 4. Heat a large nonstick skillet. Place 3 sandwiches in the skillet and cook over moderate heat until golden and crisp and the ganache is melted, about 2 minutes per side. Transfer the sandwiches to a platter. Repeat with the remaining sandwiches. Serve the sandwiches with the caramel dipping sauce. MAKE AHEAD The ganache and caramel can be refrigerated separately for 3 days. Bring to room temperature before using.